Bob Walker won the Conservative Club Club match on Kingsland Fishery Big Carp Lake. It was a great weekend of action for those fishing the Decoy Lakes complex with some huge weights recorded despite the strong winds whipping across the fens. In the Decoy Open match young Tom Edwards continues to make a name for himself bagging a fine net of carp from peg 13 on the Beastie Lake. Tom fished up in the water feeding heavily with casters and worm to weigh in a massive 253lb. Second place went to Anthony Edwards. 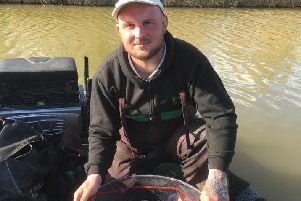 He was on peg 1 and put 196lb 6oz to the scales taken close in with sweetcorn and then came Sean Higginbottom fishing pellet and corn from peg 24 for 168lb 14oz. In the fisheries over 55’s match on the Oak Pool, it was Chris Baldwin out in front. He caught 97lb 1oz from peg 7 catching on maggot and caster. Martin Parker took the runner up spot fishing a feeder with pellet for 96lb 2oz, followed by Gordon Parker on 93lb 7oz. JVAC were on the Cedar Pool and a full house saw Jim Regan romp home with 156lb 12oz. He drew on peg 26 and caught his fish on a short pole line with red maggot. A maggot feeder approach put Roy Wells into second place with 107lb 2oz and then came Andy Gausden who caught later in the match fishing red maggot in the margins for 91lb 9oz. In the Peterborough Conservative Club match on the Kingsland Fishery Big Carp lake, those with a favourable wind romped home putting some very big fish to the scales, but those fishing headwind however found it tough going. Top rod with 128lb 7oz was Bob Walker who caught off the top steadily all day. It was much the same for runner up Alan Porter who put 116lb 12oz to the scales followed by Mark Parnell who fished the feeder in conjunction with small PVA bags, a very successful method down south, but yet to take off around our local waters. Mark caught a very respectable 79lb 15oz. The following day it was Fenland Rods turn to sample the fishing on the Kingsland Fishery Big Carp Lake and what a cracking match it was . James Garner doesn’t fish as much as he would like, but when he does he always seems to do very well. He drew one of the fancied corner pegs and fishing a short 10ft rod fairly close to the reeds with cat meat, he caught steadily all day and put a good catch of carp averaging 7 lb to the scales to finish with 202lb 11oz. Drawn at the other end of the match, and again in a corner swim, was Kev Lee who also fished meat for 173lb 7oz to secure second place. Neil Garner came third on 133lb 2oz, followed by John Garner with 126lb 6oz.